My Hungarian friend contacted me around 9.10 pm when he arrived nearly in The Hague. I replied that he could get off the bus in The Hague and Leiden is quite close to the city. When I lay in my bed he sent messages that he reached Leiden central station about 9.50 pm. I went to the bike shed on the basement and rode my bike towards Leiden central station. When I got to the station 20 minutes later, it was already dark. My friend was standing in front of the station building. He was wearing a hunting cap and backpacking like an ordinary traveller. We hugged with joy first and started moving towards my accommodation. We talked about our daily lives each other and exchanged small gifts. What I expected from him was an excavation report on Tintagel in Cornwall. He gave me a small flask bottle for drinking and shaving gel. I gave him small souvenirs of Leiden such as key-holders, badges, and sweet cookies in a round metal box. He may have been tired of long journey due to 8 hours staying in the bus. Therefore, I showed him a bathroom and let him take a shower. After shower, he wanted to browse the garden with a cigarette. I guided him to the garden and we talked there 10-12 minutes. His sleeping space was my bed place without mattress. He expressed his gratitude and lay in the bed with his sleeping bag cover. However, it may not have been uncomfortable to him, because his space was composed of wooden panels like a ladder. In my case, I had backbone ache due to the lack of supporting panels. The first night was not easy at all. Next morning on Thursday, I got up earlier than him and waited him to be wakening until 7.30 am. My cousin and I were due to meet at Amsterdam central station around 10.00 am. I briefly cooked 2 fried eggs and prepared for 2 tomatoes. We had them and left my room together around 8.30 am. While we walked to Leiden central station, he asked me where toilet is nearby. He found a small coffee shop and led me into it. We sat on the chair outside. He ordered a cup of espresso macchiato and garlic bread. I did that of espresso. It was the day of another simple breakfast for us near 9.00 in the morning. The autumn was coming. Leiden showed us off its beautiful scenery in the end of July. Every moment being with your friends, family or the others is precious. It never returns to you. That is the reason why you should think it is essential. We walked to the train station and when we were passing the west gate of Leiden, the Morspoort, a male passenger told us the brief history of the west gate and Rembrandt. According to him, Rembrandt was born near the windmill in Leiden, he looked very proud of living in the same place as Rembrandt. Indeed, his explanation was interesting and it was enough to stimulate our curiosity. Unfortunately, we were already late to leave for Amsterdam central station. We walked hurriedly to the station to get on the train to Amsterdam central station. Next time When you approach the gate from out of town, go through the gate, turn right at De la Soul terrace, walk past the Mill and cross the bridge, continue a few steps ahead and on your left you have the location of Rembrandts home. Look to your right for a statue of a painting Rembrandt. Enjoy! My friend and I visited Rembrandt Park next day. It was rather small but impressive. Thank you for your comment. 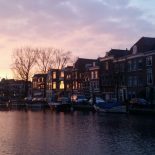 This entry was posted on September 15, 2015 by in Culture, Leisure, Living in Holland, Travel and tagged Amsterdam, culture, leiden, travel.